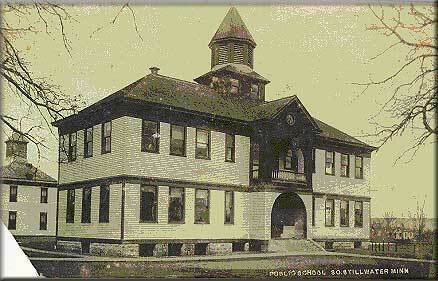 South Stillwater (Bayport) School. From the collections of the Washington County Historical Society, postmarked 1909. YEARS SCHOOLS BUILT 1875; remodeled in 1880. 1891 a two-story, two-room building was erected on same site just north of the other building. 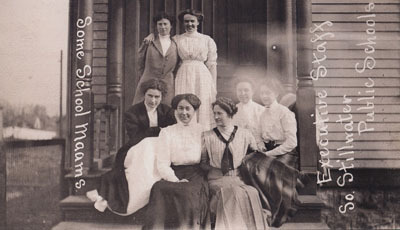 December 1893 the larger building was destroyed by fire, and the following year a six-room building took its place. GENERAL LOCATION First school located across Pickett Street from St. Michael’s cemetery in Bayport. Additional schools were built near this area. DISTRICT BOUNDARIES Bayport area, south of Oak Park Heights, bordering the St. Croix River. DISPOSITION Razed, became part of District #834. Appeared in the Stillwater Gazette “Our County Public Schools series” on January 18, 1899. Above photo from the collections of the Washington County Historical Society, and is postmarked 1909. Note the smaller, two-story building at the left of the photograph. In 1898, there were 359 pupils attending school within the district.